The aim of the research group is to create, collect, and communicate a body of knowledge in the area of operation and maintenance engineering with focus on the applications in the cold climate regions. The research area of the group is multidisciplinary in nature, involving various fields of engineering and its management related to different industries including oil and gas, marine, mining, energy and process industries etc. Therefore, the research are is organized into three different and overlapping topics to bring focus and clarity in our R&D process which is presented in Figure 1. The research in the area of RAM aims to tackle the issues posed by the failures in engineered products, plants, and infrastructure with emphasis on their applications in harsh operating environments such as the one in the Arctic offshore. In that sense, RAM engineering and analysis can aid stakeholders in reducing downtimes and operational risks, as well as optimising decision making processes by providing technical information and establishing bases required for reliable designs and operations. 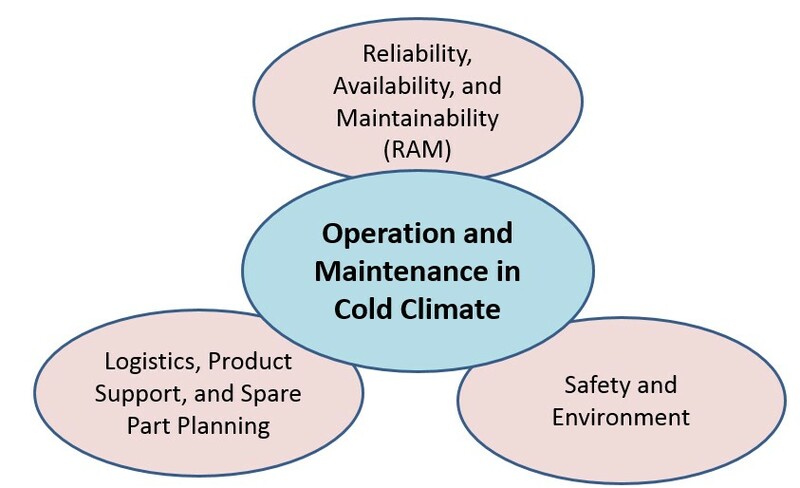 Research aims to reduce the product life cycle cost in the cold environment, and to improve the logistic efficiency with more cost-effectiveness, without compromising the availability and safety. This research area is multidisciplinary. Our focus is to build up our academic knowledge in this research area, and most importantly to help industrial partner to enhance their competence in cold climate region. The safety and environment research aims to reduce the negative environmental impact from increasing industrial activities in the Arctic region, to promote a safe living and working environment in the region. The research focuses on investigation and mitigation of the environmental problems in the Arctic, environmental impact assessment and the challenges under global climate change context. The research can aid the sustainable development of industry activities in the Arctic region and improvement of academic knowledge in this area in the Arctic. Cold Metal Transfer: New, efficient and low cost method that creates innovative business opportunities in offshore, process and mining industries. Maintenance optimization and risk reduction through an effective design for performability in the Arctic.